Rahu is shadow planet. It has no nature. Individually Rahu has nature of Shani. In astrology, Rahu is factor of separation, communication, acting, mystery and poison. 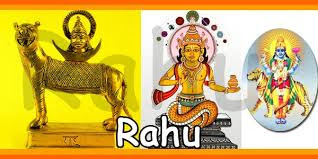 Rahu decrease the good effect of planets and increase inauspicious effect. Rahu becomes auspicious with lagan, third, sixth, seventh, tenth and eleventh house. In other houses Rahu removes the effect of those house. Aries: Rahu may create obstacle in career and money. Chant “Om Ram Rahavae Namah”. Taurus: Rahu creates obstacles in marital life and luck. Offer water mixing sesame in people tree. Keep pious on Saturday. Gemini: Rahu may separate from home and brothers. It affects your speech. Offer water to Sun. Feed poor people on new moon day. Cancer: Rahu affects marital life. One always get debt. Wear a piece of sandalwood in blue color cloth. Avoid lying. Leo: Rahu impacts on business and property. One might face litigation. Wear square piece of silver in throat. Flow alcohol or vinegar in flowing water on Saturday. Virgo: Rahu creates obstacle in education. A person become stubborn. Wear ivory or shell. Donate Rahu’s stuff. Libra: Rahu creates problem in property. One cannot get happiness. Donate light. Chant Rahu’s tantric psalm. Scorpio: Rahu affects the relations with siblings. One gets job away from home. Apply sandalwood tilak. Always keep coconut in worship place. Sagittarius: Rahu creates fraud. One gets shortage of money. Wear shell or ivory. Use sandalwood fragrance. Capricorn: Rahu affects health. One gets mysterious disease. Chant Rahu’s vaidik psalm. Always eat pious food. Aquarius: Rahu creates quietness. It also creates habit of alcohol. Wear a piece of sandalwood in blue color cloth. Maintain good relations with father. Pisces: Rahu affects the image. One faces ups-down in wealth. Wear square piece of silver in throat. Keep peacock feather. Good Luck: Visit Hanuman temple and chant Hanuman Chalisa. This avoids physical problem related to Shani.